Hero MotoCorp hasn’t had a successful streak in the performance motorcycle segment after several takes on it. The attempts were good, but they didn’t click with the market primarily due to lack of appeal and competition benchmarking serious European rivals even in the entry-level 200cc segment. The game bar is set higher so Hero did the same. The Xtreme 200R was just that and we were impressed with it as a package at the BIC when we test rode it there. We eagerly waited to test it back home and it is finally here and met its rival on the road too. The Apache RTR 160 4V is a rival which aces almost all 150cc bikes from the Japanese brigade because it turns out to be far more superior in every regard. It was natural to put the very cleverly positioned Xtreme 200R against it because Hero is replying with the age-old way of more capacity for a lot less money. The 200cc 18 PS and 17 Nm package revival is we think the ideal way to take care of the 160cc club. How are both to ride back to back? Read on. The Xtreme 200R looks more appealing and has more road presence because of tall and long stance and muscular fuel tank and large decals that help it stand out. The RTR 160 on the other hand also comes close with its paint schemes, extremely high-quality materials and fit-finish levels which make it look like a quality product from far of. The sporty and purposeful stance of the RTR 160 helps it gain the enthusiast attention a bit more. It looks more modern and refreshed while the Xtreme 200R, in short manages just about right with its conservative lines and elements that it offers such as the head and tail-lamp design along with long barrel exhaust. Meanwhile, the RTR is completely opposite in regard to these three elements and looks more appealing. Xtreme 200R finish looks a bit industrial but most parts that you touch and feel are good enough for this price and segment. Cluster is where the Hero Xtreme 200R lacks as the RTR 160 has a host of features in its full digital cluster where the traditional analogue tachometer and digital speedometer is always great, the design is a bit outdated. RTR 160 cluster has lap timer, service reminder, clock battery indicator, multiple trip meter, odometer, welcome message and more. Gear shift indicator is on the Fi version and not on the carb. Xtreme meter gets service reminder, trip and odometers and misses out on a clock. Switchgear is similar on both bikes and quality is similar too. The engines is where there are similarities found and not at the same time. Let us explain. The 200cc 2-valve, the oil-cooled motor makes 18 PS of power and 17 Nm of torque. The 4-valve 160cc motor makes 16 PS of power and 14.8 Nm of torque. The kerb weight on the Apache is 143 kgs, meanwhile, the Xtreme 200R weighs 148 kgs. The shorter gearing and narrow power band on the Xtreme 200R helps it surpass that weight and both bikes do 0-60 km/hr in 4.5 seconds and 0-100 km/hr in 14.5 seconds. The RTR 160, on the other hand, has excellent rideability and a tailored power band just like the Xtreme 200R. One of the few bikes tested on the track and on the road! However, the overdrive ratio on the Xtreme 200R is shorter and hence top speed is just 112 km/hr and the RTR 160 does 120 km/hr easily on the VBOX test that we found. RTR 160 delivers 54 km/l on the highway and Xtreme delivers 50 km/l. Xtreme 200R delivers 39 km/l in the city and RTR 160 delivers 43 km/l in the city. In terms of feel, the RTR 160 engine smoother and sounds more sporty. Meanwhile, the Xtreme 200R is commuters in both these aspects. The NVH levels even when pushed hard, these both bikes barely deliver any vibrations, heat or harshness which is great aspect on the track and on the road that we realized on both these bikes. Both bikes have light clutches and smooth shifting gearbox. Dynamically, the RTR 160 4V feels sportier and fun to ride and most engaging with a fantastic suspension setup and agility inspiring front-end geometry. The Xtreme 200R does the same as well but it feels more accomplished with its suspension as it can take bad roads rather well but the RTR 160 4V can feel a bit stiff. The shorter wheelbase on the Xtreme 200R along with great setup makes it similar fun to ride. Clearly, Hero has taken ride and handling benchmark seriously, something we reported from the track and are happy to report the same on the road. Twisty section of ghats, both were competitive, but the RTR 160 delivers a bit more emotional connect. Both bikes have good brakes, but the ABS backed Xtreme 200R is safer. 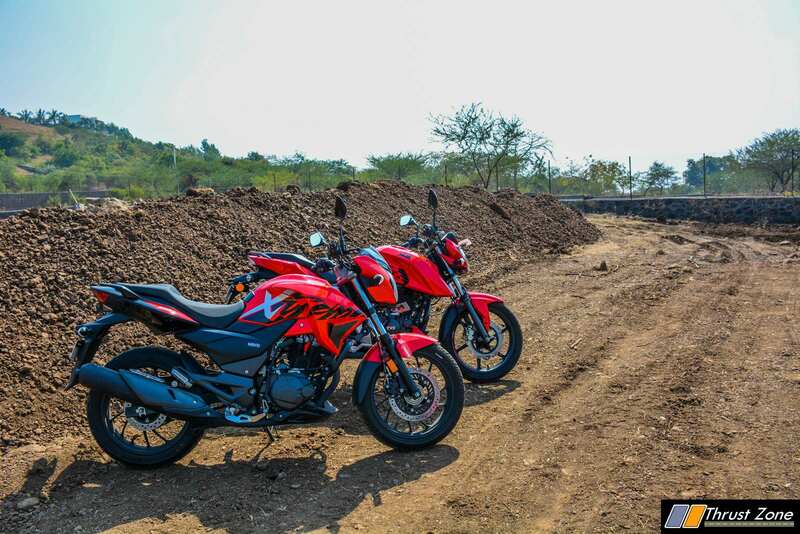 Both bikes offer 130 section tyres, but the 110 section tyre on the Apache RTR 160 with a carburetor is the popular choice in the market right now. We recommend you get the dual disc 130 section tyre on the RTR 160 4V for the full and capable dynamic package the bike can offer. Remora tyres on the TVS and MRF tyres on the Xtreme both are equally good. Clearly, this battle of different capacity has come quite close and now you the reason why we bought them together. These two bikes are similar in performance and dynamically, there are again quite close as both represent different ways of doing the same thing. The pricing though sets them apart. Xtreme is Rs. 91,000 and the dual disc RTR 160 is Rs. 85,000 ex-showroom Mumbai. Xtreme gets ABS which makes it quite good value for money considering it also has a bigger engine here and has potent mid-range on offer as a result. The Hero strikes hard and knocks out every other 160cc bike out of the frame but comes a close second to the RTR 160 4V which wins this test by a subtle margin as it completes the package a bit better.